As the NFL football season kicks off in the next two weeks, U.S. businesses may be worrying about their employees playing fantasy football during work hours. But now there is a company providing a solution to the problem. Since I participate in multiple leagues, it makes it that much better. FantasyFootballStarters.com, a website that offers free fantasy football software, provides instant on-demand predictions to thousands of fantasy football fans to help them draft a fantasy roster, analyze trade offers and help them set their weekly line-up in a matter of minutes. Why should employers care? According to a report from research firm Challenger Gray & Christmas Inc., fantasy football will cost U.S. employers $9.2 billion in lost productivity in 2008 alone. The Fantasy Sports Trade Association estimates close to 20 million NFL fans play fantasy football and spend on average five hours a week researching and thinking about which players to start on their fantasy football roster. Challenger, Gray and Christmas estimate that workers spend at least an hour per week managing their team on company time. Experts say that the habit of seeking out fantasy football advice during work is likely to continue, and it would be unwise for employers to attempt to crack down on their employees for the practice. "Behavior never changes; people will continue to research their fantasy football picks and if there is a tool out their making it faster, easier and fun to use, let them use it," says Lori Coruccini, president and CEO of Predix, a management consulting firm that specializes in providing behavioral assessments to U.S. companies. "fantasy football is becoming mainstream and studies have proven employers that provide a little perk like this during business hours to employees will go a very long way at sustaining positive morale." 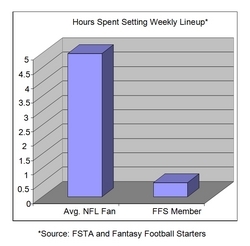 The Chatfield Group (TCG), a Mesa, Ariz.-based technology company, has already seen an increase in morale of their employees who participate in fantasy football leagues, just by allowing them to access http://www.fantasyfootballstarters.com free fantasy football software during work time. "Let's face it, so many employees give their heart and soul to their job and with the stress of commutes, busy schedules and job demands it's the least we can do to allow them to access this time-saving software during their shift," says George Yogurtian, general manager of TCG. "It's been well received and the fact that it helps them win makes it that much better," Yogurtian says. "I spend long hours in the office and knowing I can take a few minutes out of the day to make my fantasy football picks without hiding behind a cube makes me feel like the company trusts my decision making and knows I won't abuse it," says Tom Celik, business development leader for TCG. "Since I participate in multiple leagues, it makes it that much better." With tens of thousands of users taking advantage of the free version of its web based fantasy football software, FantasyFootballStarters.com is experiencing tremendous growth and popularity. Couple that with the accuracy of the prediction tools, more than 80 percent of their members surveyed stated the website does help them win. Consumers simply register, enter their personalized league's scoring system, then view fantasy football player predictions on-demand and updated 24/7. The company has a team of fantasy football experts that maintain all NFL player injury updates, starting status and simulates game predictions everyday between now and the Super Bowl. "We are all about helping fantasy football fans win their league," says Russ Bliss, one of the founding partners and a nationally recognized NFL fantasy football analyst. "The fact that it can take less time for fans to pick their fantasy football rosters is icing on the cake."